We wandered up and down the town streets, and the most important memories stayed just out of my grasp. There was the town square where the bullfighting ring was set up. There was the baseball field, exactly as I remembered. We had just passed the school, which had many more buildings than I recalled. There was the beautiful blue and white church who’s plaza served as the bus stop. There was the “soda stand” where we often sat outside and had a coke (or sometimes, a beer … shhh!). It had been ten years and so much looked so familiar, and yet I still couldn’t locate my host family’s house. We walked up the street I knew they lived on. Most of the way, until I had certified that every house along the way was not there’s and that it was certainly closer to the main road than we ended up. So we started back. There was one house that had potential, but it was quite different than I remembered and completely shuttered. So I asked a neighbor. After a lengthier exchange than necessary on account of my Spanish, I was assured they lived there and I only need knock on the door, they were in. So with a fair bit of nervousness and hesitation (would they remember me? is it strange that I’m dropping in totally unannounced after ten years?) I chose a door (there were four that all could’ve passed for a front door) and knocked. When it opened, I immediately recognized the faces on the other side. One belonged to my host mother and the other to Kaylee, who was eleven when I last saw her. Though now 21, she had the same face. Fortunately, they seemed to immediately recognize me and invited us in. Whew, first butterfly removed. And it was quite strange, because we immediately fell into conversation. About who was doing what after ten years. When I had been there, there were five children between 5 and 16. Shockingly, they had all aged ten years, just like I had. One daughter was studying medicine in Rivas, another was married and lived up the street and had two children (one a mere five days old). Another had a one year old son, Lionel, who stumbled around the room and took a particular liking to Theresa. Another son was working in the tobacco fields with his father, but the most startling to me was Franklin. Franklin was five when I left, and we had many a good time playing (it’s always easiest to befriend children in foreign languages … deep conversation is not necessary and they are so open and friendly and fascinated with you). They said Franklin cried and cried when I left. Well, he was now 15, finishing high school. 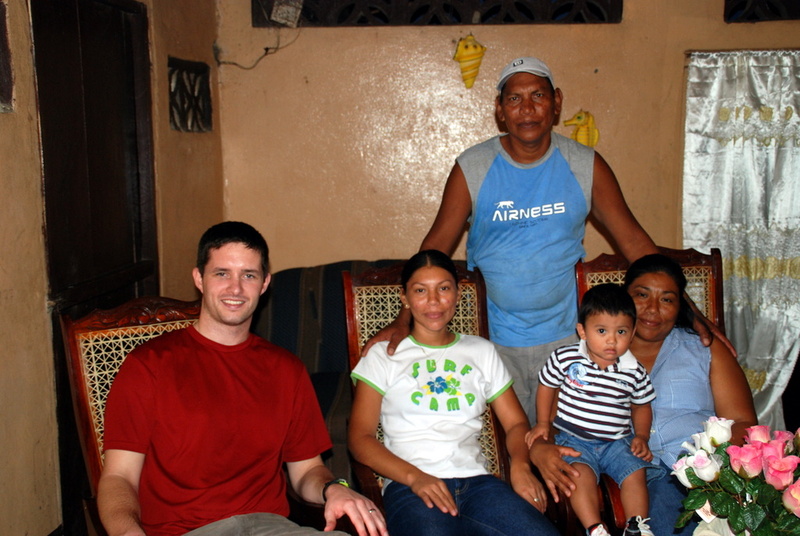 Soon thereafter, the father of the family, Zacarias, returned, and we had as thorough a conversation as we had ever had. Interestingly, I could feel my Spanish getting better as I talked to them (or else they were exceedingly good at understanding my broken Spanish) and I learned about many things. How this season was unusually rainy (as the rain fell outside). What that meant for his tobacco crops (not good but not a huge problem). Where the tobacco was sent and what became of it (cigars in Esteli). How cell phones and internet worked on the island (great and not so great, respectively). How it was a different world since I’d been there. Not to mention the always inquisitive Theresa had me ask about a bajilion questions, including ones had no idea how to ask. I think she learned a few things too she’ll post about.